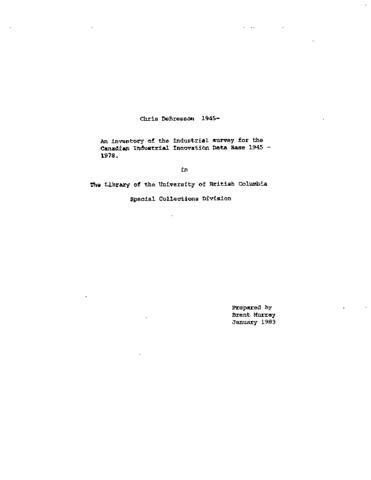 Chris De Bresson was the principal investigator for the Canadian Industrial Innovative Data Base, a survey of industrial innovations in Canada from 1945 to 1978. The collection consists of files created as a result of the Canadian Industrial Innovative Data Base survey, which was conducted from 1975-1980. The collection includes confidential and non-confidential files of Canadian firms, including questionnaires, correspondence, and product brochures, relating to their new products and processes (1945-1980). Half of the files are accessible only with permission of Chris DeBresson and the permission of the respondant firms.